If you are on the receiving end of seed catalogs or have been to your local farmer’s market lately, you’ve probably seen or heard of the Indigo series of tomatoes. These Indigos are a relatively new addition to the tomato family, and are becoming quite popular. For good reason too: they look pretty cool with their deep purple shoulders, and that dark purple comes from anthocyanin, a powerful antioxidant found in many dark fruits. 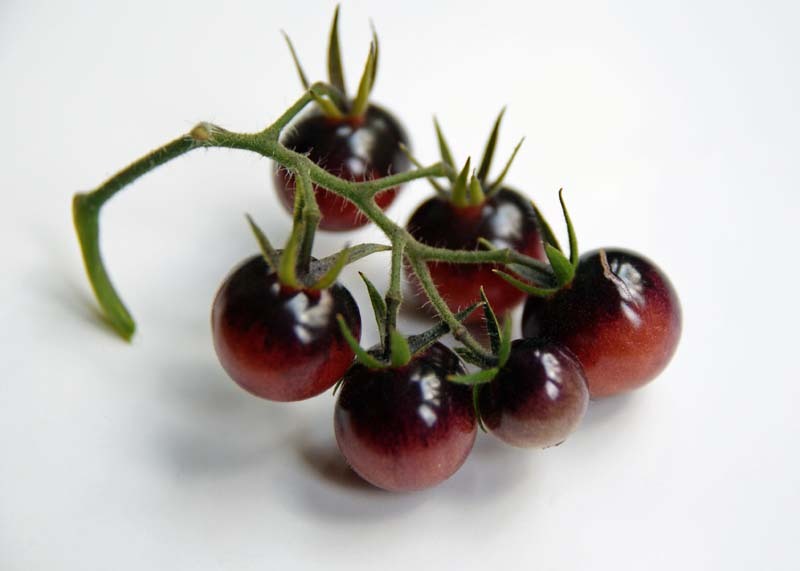 And the best part is they were developed using traditional breeding techniques (no test-tube tomatoes for me, thank you), utilizing wild species that contained the anthocyanin genes. The first generations received mixed reviews: looked nice, but the flavor could be lacking, to put it mildly. Although in all fairness, the tasteless fruits may have just been picked too early. A recent addition to the mix is the Blue Berries tomato, which I decided to try this year after reading more favorable comments. Blue Berries tomato is a cherry-type, with clusters of 6-10 fruits roughly 1″ in diameter. It is indeed a striking tomato, and the purple appears on the shoulders right away, which is probably why some people inadvertently pick them too soon, assuming that purple = ripe. Not true though – the purple is there from the start, but the underside of the fruit is green, gradually ripening to a deep pink-red color. If there’s still green on the bottom, don’t eat it. Another possible indicator is firmness – even after it starts to turn pink, the tomato will be pretty hard. When it is truly ripe, it will give slightly when you gently squeeze it. But really, don’t let this scare you away from trying them; it’s easy to figure out when they’re ripe once you’ve seen them. I like growing for visual appeal, but it has to be edible too. The taste of these was not the insipid flavor that I had been warned about in older family members. Blue Berries has a pretty solid tomato flavor, more acidic than sweet, but not as tangy as some of my green tomatoes. Sungold it is not. Although I tend to prefer my cherry tomatoes on the sweet end of the spectrum, this provides a nice balance when used in salads and cooking. They were fairly prolific, producing all the way to the bitter end of the growing season. I did like the fact that there was no splitting that I noticed, while almost all of my other cherry tomatoes did exhibit varying levels of cracking with the schizophrenic rain pattern this year. Not the best tomato ever, but definitely solid enough to bring it back next year.